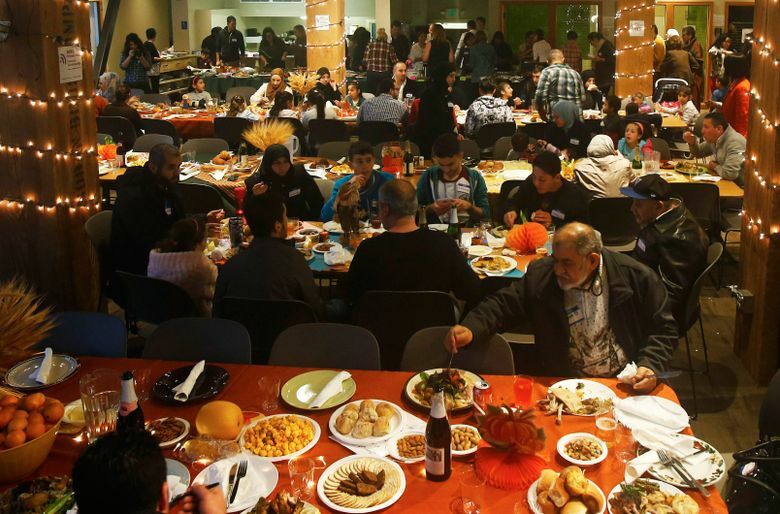 The Thanksgiving dinner for Syrian refugees started as a small celebration and grew to a gathering of about 100. 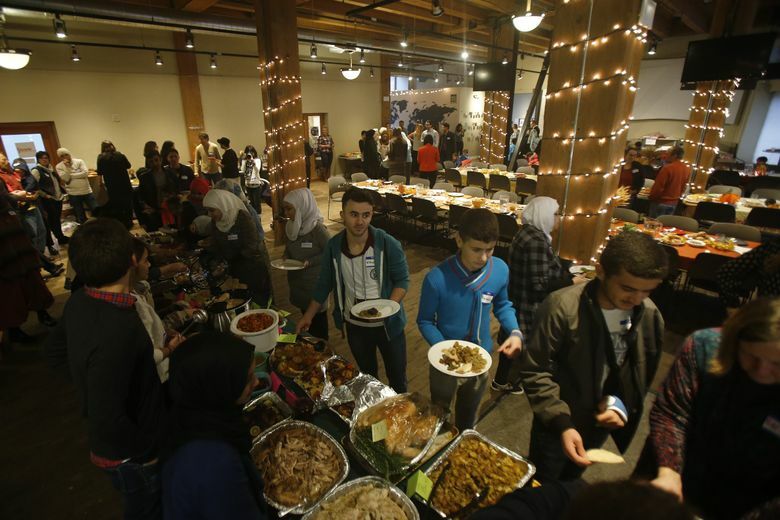 Leo Giessman usually heads to the mountains with his father over Thanksgiving, but this year, the 12-year-old from Kirkland wanted to stick around town to welcome Syrian families to their first Thanksgiving in America. “I love helping people. 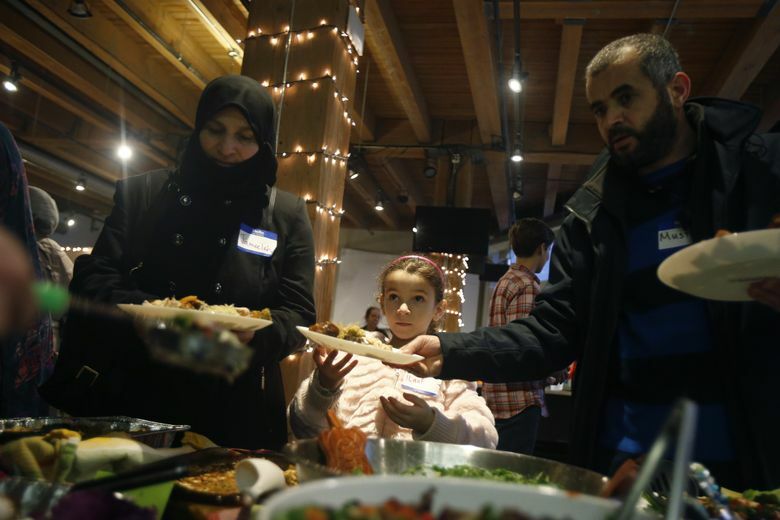 It makes me feel good,’’ Giessman said as he waited for the arrival of about 40 Syrian refugees, all invited to share a holiday dinner with a welcoming community of locals in Seattle’s Pioneer Square. 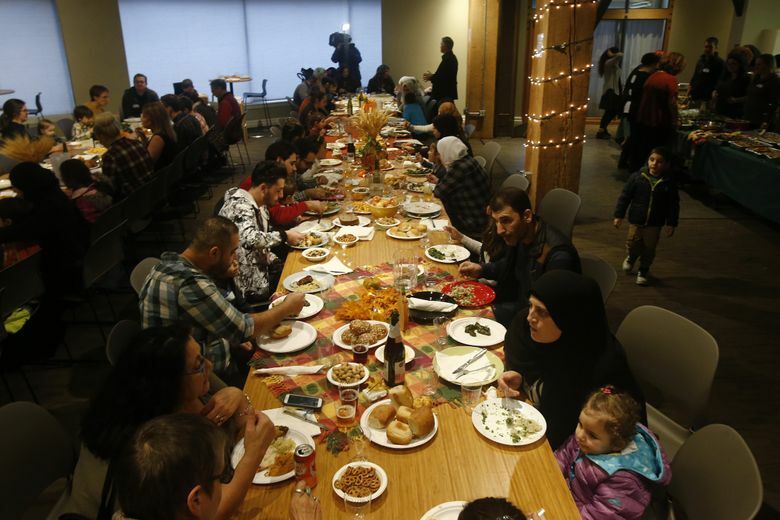 Thursday’s dinner was initially intended to be a small gathering at the Tukwila apartment complex where many of the families have settled after long, arduous and often traumatic journeys from their homes in war-torn Syria. 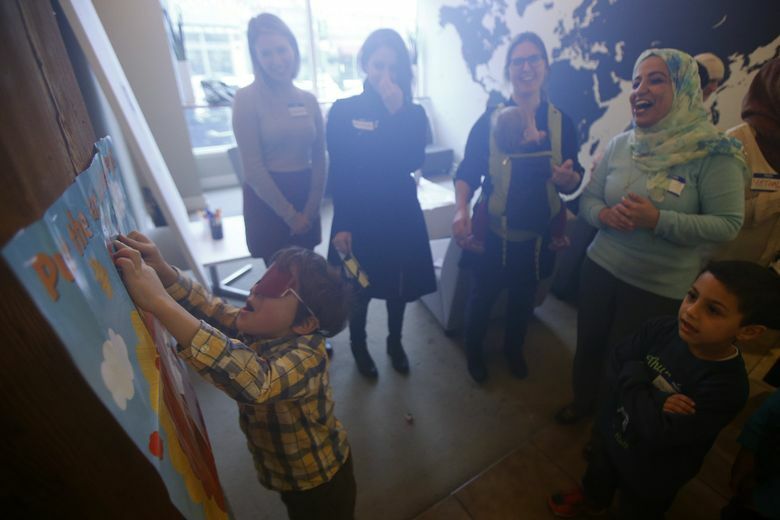 But as word got out, so many people wanted to welcome the families that the celebration was moved to Impact Hub, an event space, said organizer Kirsten Rogers. Rogers, a former Peace Corps volunteer who speaks Arabic and began teaching English to children at the apartment complex about two months ago, said as many as 50 volunteers became involved in planning and cooking, and donating food, money and supplies for the dinner. 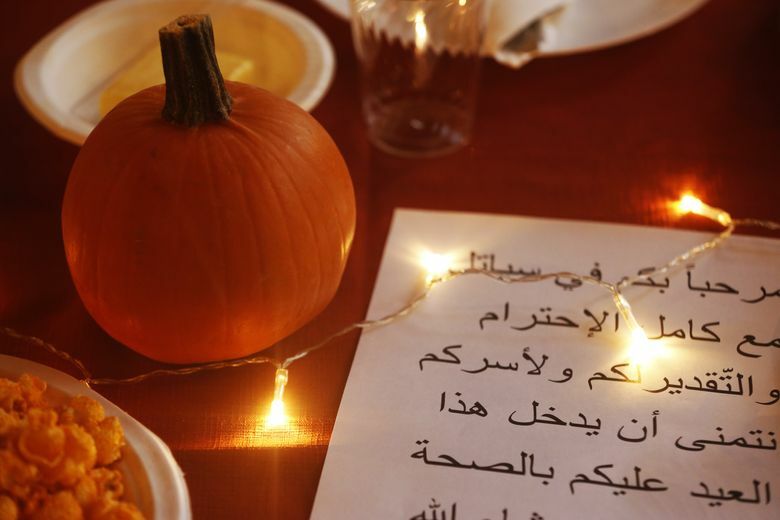 The Syrian families brought dishes from their culture, placing them on the banquet table next to traditional Thanksgiving fare, including turkey, mashed potatoes and string beans, all prepared according to halal guidelines for the Muslim guests. Fatuma Mahmud, 20, an Eritrean refugee who came to Seattle as a child, was tasked with writing descriptions of the dishes in the new language she has been studying: Arabic. She was doing fine until she came to Brussels sprouts and cranberry relish. Some things just don’t translate, she said. Mahmud said she volunteered at the dinner because she wanted the Syrian families to know they are valued. There were a few awkward moments when local women greeted the Muslim men with a handshake. But the gestures were greeted like the warm welcome they were meant to be, as others gently explained that, for some Muslims, unnecessary touching between sexes is prohibited by their religious beliefs. Mustafa Almustafa, who brought his family of seven to the celebration, said integrating into the community has been tougher than he imagined, mostly because it’s been hard to learn English. The family lived in Turkey for three and a half years after fleeing their home in Idlib, Syria. They’ve been living in Tukwila for eight months, and the children — three boys and two girls, are already in enrolled in school. He seemed overwhelmed at the number of people who turned out to celebrate his family’s first Thanksgiving. Susan Kelleher: 206-464-2508 or skelleher@seattletimes.com. On Twitter @SusanKelleher.